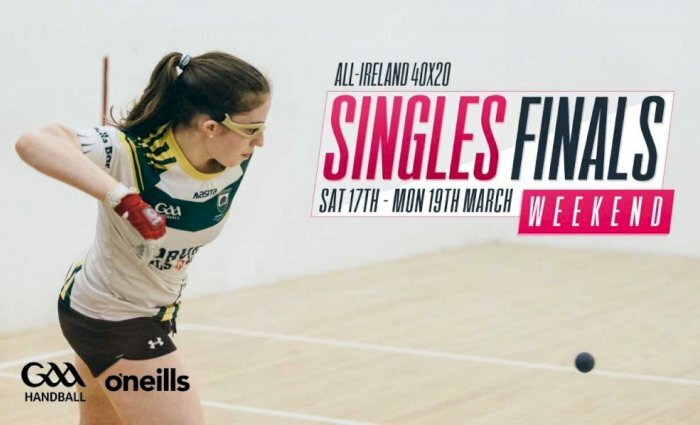 In the build up to the staple event of the Ladies Senior Singles Championship, the 2018 O’Neills 40×20 All-Ireland Senior Singles Final, GAA Handball spoke with Cork’s Catriona Casey. After a brief congratulation on her Semi-Final success over Kilkenny’s Ciara Mahon (21-1, 21-0), Casey is humble in her acknowledgement. Reiterating her sentiments in her post Semi-Final encounter interview, she notes again that the score line does not reflect the game. She is still happy with her overall performance, but, like a true champion, she still has areas that she wants to improve on for the big event. Past encounters will count for nothing. On that note, Casey and McMahon have now faced each other numerous times in all codes of Handball. For the majority of these, Casey has come out the champion. Surely the pressure is on the Ballydesmond star’s shoulders to perform on this occasion. With a cool head and a glimmer in her eye, Casey states that there is going to be pressure in any major final, regardless, however, her intention is to channel that pressure positively. She continues by saying that both players have learned from each other in the past and know what to expect, it will just come down to who performs on the day. It’s a very true court in a fabulous facility and I very much look forward to being back on Court 1 for Finals day. Moving to what lies beyond All-Ireland glory, this year’s extra incentive of Team Ireland Captaincy, GAA Handball asked the reigning All-Ireland champ if she was including this aspect in her mental preparations for the feat that lies before her. Again, with a steely resoluteness in her voice, she answered simply that it is an ‘extra bonus’. Noting that whatever way the chips may fall, she will be travelling to Minnesota to compete, but, it would be an honour to represent Team Ireland in the process. Handball is my passion; I love to watch it and I love to play it. Adding that she has put a lot in to the sport at this point, but has also gotten so much back; close friendships, exciting opportunities and most importantly, life lessons about the importance of discipline and resilience. She concludes the interview by stating that she hopes to be involved in Handball for a long time to come, and is very grateful to all who have helped her along the way. With all the commotion and build up that goes with the run up to a pinnacle sporting event, GAA Handball spoke to the always cool-headed Limerick star, Martina McMahon. McMahon is no stranger to the bright lights of All-Ireland final day, yet, she still has not captured the crown of the small alley. This Saturday will see her second attempt at ousting the reigning champion and always clinical, Catriona Casey, and in the process, provide spectators with what is sure to be the game of a lifetime. I’m delighted to say the least, Reilly is no easy feat. I’m going to give it my best shot, there’s a double achievement at stake and I am not going to pass up on this offer too easily! If your head isn’t in the game, how is your body supposed to be? Despite the strives that she has made, she does note that there is always room for improvement and all the work that she has been doing needs to be brought into the alley this weekend. Reflecting once more on what a win this year would mean, McMahon is adamant that the chance to captain Team Ireland is part of her arsenal when it comes to motivating herself for this game and is trying to use that to the best of her advantage. Whatever side you are batting for in the upcoming decider, there is no doubt in anyone’s mind that this is a game not to be missed.